The 2015/16 Alberta provincial budget introduced on March 26, 2015 by Finance Minister Robin Campbell focused on addressing the budget shortfall precipitated by the dramatic drop in global oil prices which started in late 2014. With government attention concentrated on plugging the “$7 billion hole,” little attention was given in the budget to tackling another pressing issue in Alberta: high, and growing, levels of income inequality. This fact sheet analyzes the reality of income inequality in Alberta—the worst in Canada—and how the province’s personal income tax (PIT) structure is contributing to the growing gap between the rich and the poor in the province. Statistics Canada records the total income on which individuals or economic families are assessed income tax.3 Chart 1 shows the Gini indexes for Canada and each province for 1990 and 2011 (the most recent data available). The change between 1990 and 2011 is illustrated by the change for each jurisdiction. The second approach to measure income inequality is to consider income shares. Chart 3 illustrates that the share of total income going to the top 10% of income earners in Alberta went from 31.5% in 1992 to a peak of 40.5% in 2007 (prior to the recession), a 29% increase in just 15 years. The bottom half (50%) of income earners in Alberta went from receiving over 18% of income in 1992 to just 15.9% of total income in 2012. Although Canada (including Alberta) also shows increasing inequality, it is much less pronounced than in Alberta. These two approaches of illustrating changes in income distribution indicate increasing levels of inequality of income in Alberta, and reveal that there is a greater degree of income inequality in Alberta compared to the rest of Canada. The federal income tax rate structure is applied equally to all Canadians (except Québec). This rate scheme has a graduated set of marginal tax rates with the highest rate equal to 29%; provincial rates are much less than this, and thus are each progressive to different degrees. Therefore, the changes in the after-tax Gini indexes illustrated in Chart 2 are largely influenced by provincial personal income tax rates. Alberta is currently the only province in Canada with a single-rate tax structure; however, if the proposed 2015 budget is approved following the provincial election, Alberta will also have a weakly progressive PIT. Progressive income taxes play an important role in achieving a more equal distribution of after-tax income. Alberta’s tax policies, specifically the move starting in 2001 to the single-rate 10% tax, have contributed to increased income inequality in the province, as compared to the rest of Canada. Therefore, the Alberta government needs to raise income tax rates not only to support current public expenditures and to stabilize the province’s revenues, it also needs to address fairness by bringing back a strongly progressive rate structure in order to shift the tax burden on to those most able to pay, and simultaneously improve the equality of after-tax income. 1. OECD 2012, “Income inequality and growth: The role of taxes and transfers”, OECD Economics Department Policy Notes, No. 9., January 2012. 2. Statistics Canada reports, even though a single Gini coefficient value has no simple interpretation, comparisons of the level over time or between populations are very straightforward: the higher the coefficient, the higher the inequality of the distribution, and vice versa. 3. An economic family is defined as a group of two or more persons who live in the same dwelling and are related to each other by blood, marriage, common law, or adoption. An unattached individual is a person living either alone or with others to whom he or she is unrelated, such as roommates or a lodger. Source: Statistics Canada definitions. 4. 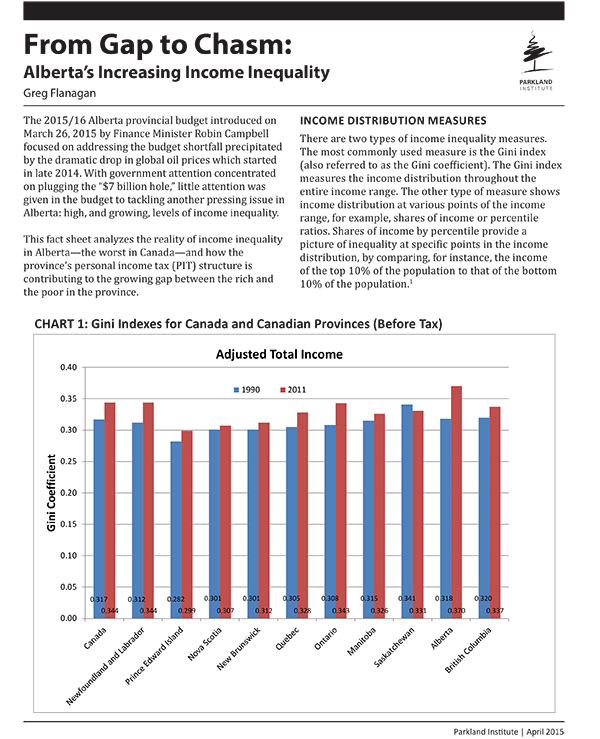 Statistics Canada, Table202-0709 - Gini coefficients of market, total and after-tax income of individuals, where each individual is represented by their adjusted household income, by economic family type, annual (number), CANSIM (database). Accessed April 15, 2015. 5. Statistics Canada. Table 204-0002 - High income trends of tax filers in Canada, provinces and census metropolitan areas (CMA), specific geographic area thresholds, annual (percent unless otherwise noted). Accessed April 15, 2015.